Miami has always been an ideal place to escape the winter blues thanks to an abundance of beautiful beaches, international restaurants and a culture that embraces art and design. Just back from a packed President’s Weekend where we ventured off the beach, in spite of beautiful weather, to discover some new finds for Daytripper365 from Brickell to Wynwood. We stayed at the Year Old 1 Hotel, where after many delays the Spartan Gym and Bamford Haybarn Spa have finally opened. Both are nice perks of staying at the hotel, which due to its large size isn’t for everybody. Each morning we did either a yoga class or an extremely challenging cross fit class in the awesome 14,000 space or outside at the dune deck. See more about the 1 hotel here. Shhh, keep this a secret. We feel lucky one of our local friends was willing to share the number of masseuse Melissa Rye, who she describes as the best at deep, intense bodywork. Get in touch with Melissa at 901-277-5115. Morning at the Harbor: Less than 10 minutes from Collins Ave by Uber, residential Sunset Harbor just keeps expanding with new great places to eat. Paradigm Kitchen, from the folks behind JugosFresh, is full of young people fresh from the gym indulging in breakfast bowls and gluten free pancakes in a bright industrial space. Lunchtime brings poke bowls, salads and wraps. Though they have coffee, try a turmeric steamer, a recipe we’re copying now at home. (blend turmeric, fresh ginger, honey, and coconut oil with steamed almond milk and finish with a cracked pepper garnish) Want caffeine, head to Panther Coffee, one of Miamis best coffee destinations, just around the corner. Other Sunset Harbor Spots, good later in the day, include: PubBelly and PubBelly Sushi, NaiYaRa for Thai and Lucali for pizza. Get Moving: We always run or walk along the beach side promenade in South Beach, but on this trip, we rented one of the Citi Bikes (with many stations on or alongside the beach) and rode all the way south to Governors Cut. From there you can continue along the bike path offering great ocean views overlooking Fishers Island and the marina. Planted: In the early morning the light is best at Fairchild Tropical Botanic Garden, home to one of the largest collection of cycads and palms. Explore the 83 acres either on foot or by tram - don’t miss the rain forest and sunken gardens. Another escape from the bustling city of Miami is to visit the Vizcaya Museum and Gardens. Artful Dazzle: The Perez Art Museum (PAMM), opened in 2013, is architecturally stunning, constructed on stilts and framed by hanging gardens in an indoor/outdoor space overlooking Biscayne Bay. Designed by acclaimed architects Herzog and de Meuron of Tate Modern fame; this museum is worth leaving the beach to visit. Have a drink or a light lunch at Verde, their waterfront restaurant and leave time for a wander on the baywalk and promenade. Sunset is a great time to visit - and don’t forget your camera! Other worthy art museums in Miami include the Rubell Family Collection and the Margulies Collection. Over in Wynwood: Leave your gluten free friends back at the hotel and head to Zak the Baker where there’s been a big change of concept in the last few weeks. The original space has been reopened as an old school kosher deli, currently serving breakfast and lunch. There’s a new spacious bakery down the street for Zak’s acclaimed breads, pies and pastries. Not everyone is happy about the changes, but once you try Zak’s morning egg platter complete with homemade latkes, cucumber salad and sourdough rye toast you may be converted. 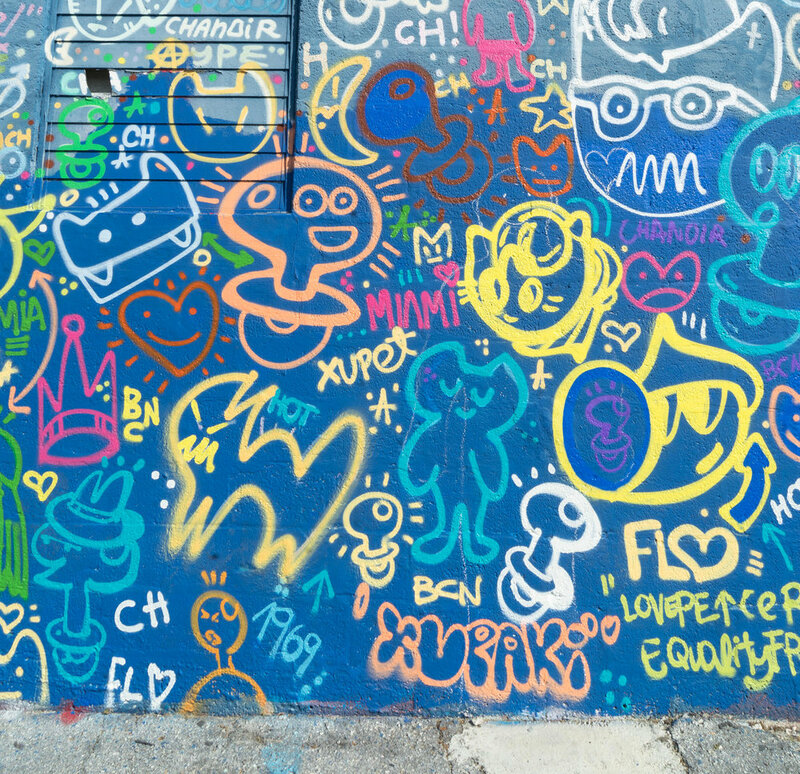 After your meal don’t miss the colorful streets of Wynwood and the Wynwood Walls, a one of a kind display of pubic art stretching throughout the whole neighborhood. When you run out of steam, refuel on the shaded patio of the original Panther Coffee. We were disappointed with critic darling Alter at dinner, finding the food too fancy and fussy, but would return to try chef Brad Kilgore’s more casual tapas menu in the new attached garden space. Everyone raves about KYU, nominated for a James Beard award, a hard to get reservation for Asian flavors with a BBQ twist. Downtown Heat: All the way from Uruguay is one of Miami’s hot new imports—Quinto La Huella located in the new East Hotel, atop Brickell City Center. We are big fans of La Huella in Jose Ignacio, having spent two holidays there (see here) and time will tell if they can recreate their beachside magic in a city environment. Sprawled across an entire floor, there is indeed buzz, glamour and a beautiful crowd. Book a table outside and go on the later side, like many trendy spots in Miami it doesn’t get crowded till 9. Have a drink at rooftop Sugar before your meal, judging by the lines when we left you wont get in after. Nearby in the new SLS Brickell, head to Fi’lia from Miami chef Michael Schwartz for his take on Italian fare, or Bazaar Mar, with a tapas style menu from chef Jose Andres. South Beach Eats: A new arrival from New York, Upland, has everyone smiling delivering the same excellent fare as its predecessor in a beautiful, though loud, space. Our friend Bryan at The Loupe, always the first to know, had an excellent meal at brand new stunner Forte dei Marmi from Michelin-starred chef Antonio Mellino. Local friends love old school Italian Macchialina, or Casa Tua where the food lives up to its romantic setting in a Mediterranean villa. Juvia, atop the Lincoln Road garage dishes up Peruvian Japanese fusion in a dramatic space complete with a large-scale vertical wall garden. Have a tiki themed cocktail at Drunken Dragon to go with your Korean BBQ. For a fancy, expensive and grown up dinner head to the Faena hotel’s Pao by Top Chef winner Paul Qui. It’s a night out, especially if you stay for C’est Rouge, the hotel’s burlesque show for dessert.